Review posted March 2, 2018. Scholastic Audiobooks, 2016. 10 hours, 22 minutes, on 9 compact discs. This is an amazing audiobook production. The story is about an enchanted harmonica. 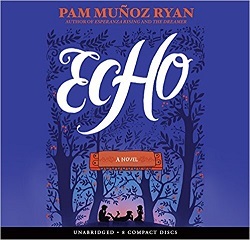 The prologue tells of a boy lost in the woods in Germany who learns about the sisters whose spirit enchants the harmonica, and who entrust it into his care. Then the main part of the book gives us three stories – first a boy in Germany with a musical gift but with a birthmark on his face that makes him seen as less than perfect and in danger in Hitler’s Germany. The second story is about two brothers in Pennsylvania at an orphanage after their grandmother became too frail to care for them. Mike is a talented piano player, and it seems they have a chance of a home, but something is wrong. Perhaps he can join the harmonica band that’s auditioning for new members. Then Ivy, in California, has to move to a new home, where children of Mexican heritage aren’t allowed to go to school with the other children. But she can join the orchestra. The three stories are told completely separately, with a different narrator for each part. What they have in common is that all involve a harmonica with an especially beautiful tone that has a red M painted on it. The three stories come together in an episode at the end, and then we get an epilogue to tell a little more about the story of the boy and the three sisters who sent the harmonica out into the world. The book is good, and won Newbery Honor. Each story has some punch to it, and each child has reason to need the encouragement that comes through the harmonica. The audio production is exceptional! There is harmonica music throughout, as well as piano music when that’s part of the story. It adds so much to hear the songs being played. Some producers might not have dared to add harmonica music when the text is raving about the harmonica’s glorious tone. But for the most part, the music played went perfectly with what was described. For several of the songs, they added a singer, which I wasn’t completely happy with – but that was a way to let the listener know the words, which was a nice addition for the child listener. Even though I know the words to songs such as “Brahm’s Lullaby” and “The Battle Hymn of the Republic” and “When Johnny Comes Marching Home,” an unobtrusive way to include them for kids was to have a voice along with the harmonica playing. This is definitely a book that has much value added in audio form! A delightful listening experience.